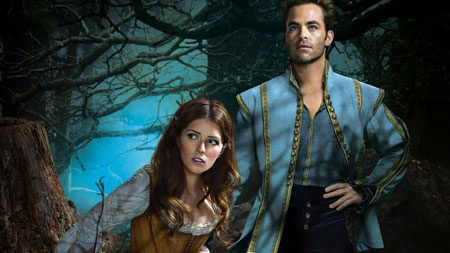 The twisted fairy tale musical “Into the Woods” is out for you to take home. Should you collect or gift it? Check out Kidzworld’s review. When Cinderella exists in the same universe as Rapunzel, Red Riding Hood, Jack of beanstalk fame, two princes and the big, bad wolf, we have a feeling that all won’t be a picnic in the woods! 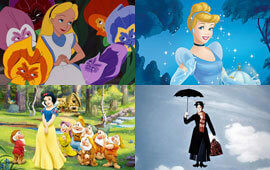 Familiar fairy tale characters all have special wishes. 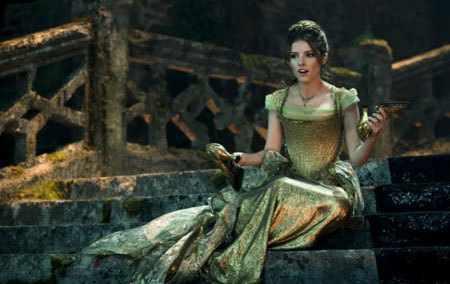 Cinderella (Anna Kendrick) wants to attend the king's 3-day festival; Jack, a poor boy, wishes that his white cow would give milk and a baker and his wife wish they could have a baby. Little Red Riding Hood buys bread from the baker to take to her grandmother's house, Jack's mother nags him into selling the cow, and Cinderella's stepmother and stepsisters say no way is she going to the festival. The baker's neighbor, an ugly old witch (Meryl Streep) tells them she placed a childless curse on the baker's father and all his heirs when she caught him in her garden stealing "magic" beans. The witch also took the baker's father's newborn child Rapunzel (Mackenzie Mauzy) and stuck her in a tower in the woods. The curse will be lifted if the baker and his wife can find four ingredients for a magic potion; "the cow as white as milk, the cape as red as blood, the hair as yellow as corn and the slipper as pure as gold," all before the chime of midnight in three days' time. All these characters journey into the woods to accomplish their wishes. 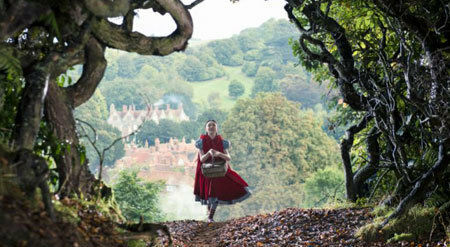 Red Riding Hood is eaten by a wolf (Johnny Depp) and later rescued. Jack is lost trying to sell his cow, Cinderella visits her mom’s grave, receives a gorgeous ball gown and golden slippers, goes to the festival and meets her prince and the baker is looking for those potion ingredients. But, things go south quickly. Although Cinderella gets her handsome prince and the baker and wife gather all the items, give them to the witch and get a baby and Rapunzel is rescued from her tower by yet another prince, Jack has stolen a treasure from the giants at the top of his beanstalk and the giant’s wife wants revenge on the tiny people below. Who will survive? Who will end up happy and who will be sorry that they ever made any wishes? 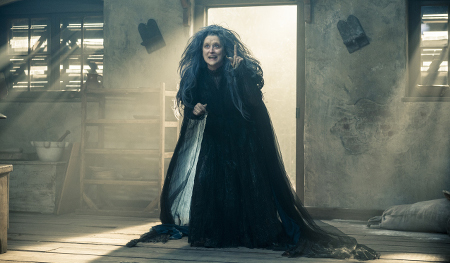 Streep Sings Sondheim – to keep the pace of the film going, “She’ll be Back”, one of the songs sung by Meryl Streep as the witch, was cut out. After Rapunzel has ridden off with her prince, the witch is sure she will return. A very nice and well-acted song to hear and keep. There’s Something About the Woods – explores the symbolism of the woods. It represents the challenges of life. 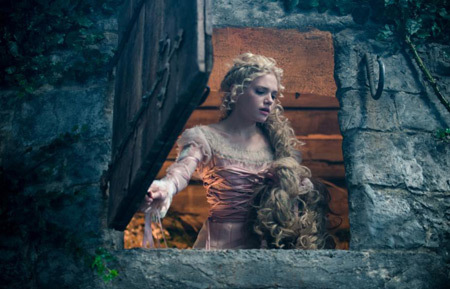 The actors and filmmakers discuss what it means to them and we hear about building the woodland sets, making them pretty or spooky, the design is discussed and writer James Lapine talks about the original idea of putting various fairy tales together. Interesting. The Cast as Good as Gold – features director Rob Marshall talking about creating a “company” of actors. Meryl Streep reveals that she was once offered three parts as a witch in one year. She explains why she took this one. Emily Blunt (Baker’s Wife) was afraid to sing as was Johnny Depp! 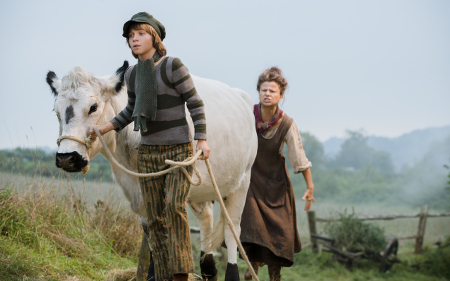 Tracey Ullman (Jack’s mom) just loved the real cow playing Milky White. One of my favorite extras for the tidbits of personal info. 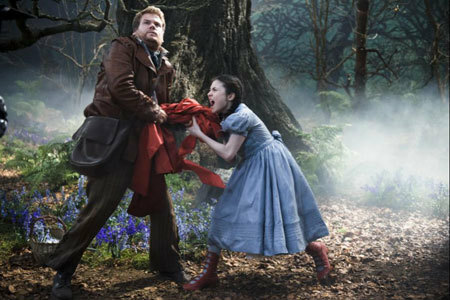 Deeper Into the Woods – This is the more extensive “Making Of” featurette but it does re-show some of what we saw in “Something About the Woods”. The story, the music are further explored. Composer Sondheim talks about the challenges of adapting his work for film. We learn that all the actors pre-recorded their songs but sang them again when they were played on set. What you hear is a mix of both. Editing is featured as is Production and set design, matching sets to the real woods. All the actors comment making the feature less “dry”. 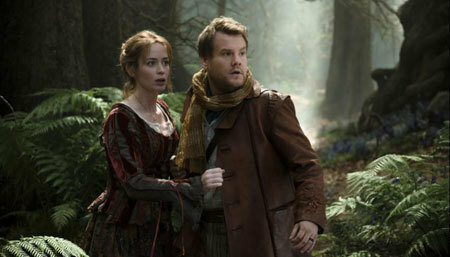 The Costumes of the Woods – I really loved this extra which focuses in detail on all the amazing, varied costumes. Oscar-winning designer Colleen Atwood talks about all her choices for various characters and the actors speak on their feelings about their costumes. Make-up and hair are also featured. Loved it! Audio Commentary – Director Rob Marshall and co-producer John DeLuca comment throughout the movie on working with Johnny Depp, horses that started galloping outside a stage so they could gallop on inside and you get fun info about cute Chris Pine and Billy Magnussen singing their prince song “Agony”, etc. Very worth a listen. You also get Music and Lyrics as an extra if you are a fan of musicals or just wanna sing along. As we said when we reviewed the film in theaters, we are going with the idea that most of Kidzworld’s younger visitors would not be familiar with the Broadway musical upon which Disney’s Into the Woods film is based sooo, a few surprises might be in store. All the warped, twisted and interwoven fairy tales might confuse younger audience members and those who expect happy endings all around in a Disney family film, might be disappointed. There are lots of well-represented lessons in the story like “Be careful what you wish for” and, as the classic rock band The Rolling Stones sang “You don’t always get what you want, but you get what you need”. 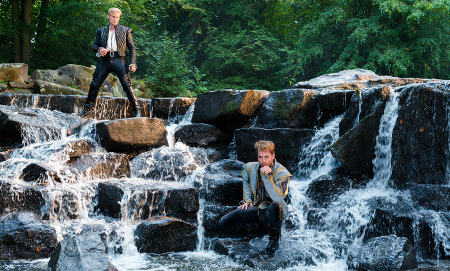 You will also chuckle especially at the tune “Agony” sung very well by Chris Pine and his ‘brother’ prince who are in agony until they can make the women they are obsessed with (Cinderella and Rapunzel) fall for them. There is no big “Let It Go”-style song you can’t stop singing but, of course, the music tells the story effectively and is sung well. This Blu-ray provides a complete “how’d they do that?” set of extras and the actors are interviewed much more than they are in some home entertainment offerings. Loved the costume/make up extra etc. Although we always love a good blooper, gag reel, we- messed-up-our-lines extra that is missing here, there is enough for us to go 4 stars for this home entertainment package. 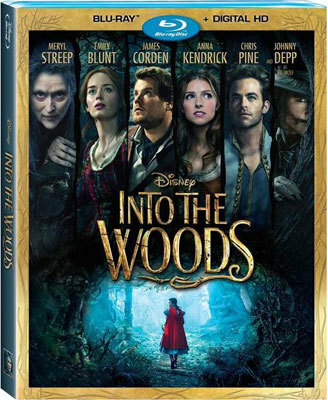 Into The Woods is now available on Blu-ray + DVD!